The verses of this song speak volumes to me about the challenges we are facing in this journey of faith. The lessons I am learning are rich & deep as I continue to learn to surrender all. I am learning to set aside my plans, my ideal settings, my preferences & my comfort for the sake of others. I thought I was getting pretty good at that as I embraced motherhood. It is constantly a life of sacrifice but God has shown me how much more I have to grow in ‘freely giving’. The comfort I take in giving without limit is that it is all ‘in His presence’ and not one act of surrender goes unnoticed by my Father. Surrendering our life challenges our comfort & pleasure. In my head I know that possessions are just ‘things’ but I have discovered that my heart has yet to be convinced. Over the past few weeks, with most of my ‘things’ packed away, I have found how much my identity is wrapped up in my possessions. What I wear, the tools I use, the comforts I surround myself with can become all too precious & important. It has been an eye opening experience to realize how little we actually need for our day to day. There is freedom in forsaking things. As a mother, I have learned the sweetness of prayer without ceasing. To talk with the Father as I make lunch or stoop to tie little shoes provides me an anchor for my days & a pathway amidst the trials. This time of trial has made clear to me how inseparable the Holy Spirit is for my daily survival. If I were to walk through my days based on my undulating tides of emotion, my life would be a wreck. Yielding to the Spirit is my salvation. 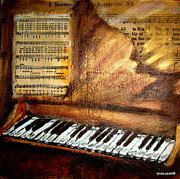 To view more paintings by Lyn Deutsch in the series ‘Hymns & Musical Instruments’ click on the image above.